The paper states: “In this work, we present a framework for learning skills from videos (SFV). By combining state-of-the-art techniques in computer vision and reinforcement learning, our system enables simulated characters to learn a diverse repertoire of skills from video clips. Given a single monocular video of an actor performing some skill, such as a cartwheel or a backflip, our characters are able to learn policies that reproduce that skill in a physics simulation, without requiring any manual pose annotations.” The video is fed through an agent that breaks down the movements into three stages: “pose estimation, motion reconstruction, and motion imitation.” The first stage predicts the frames following a subject initial pose. 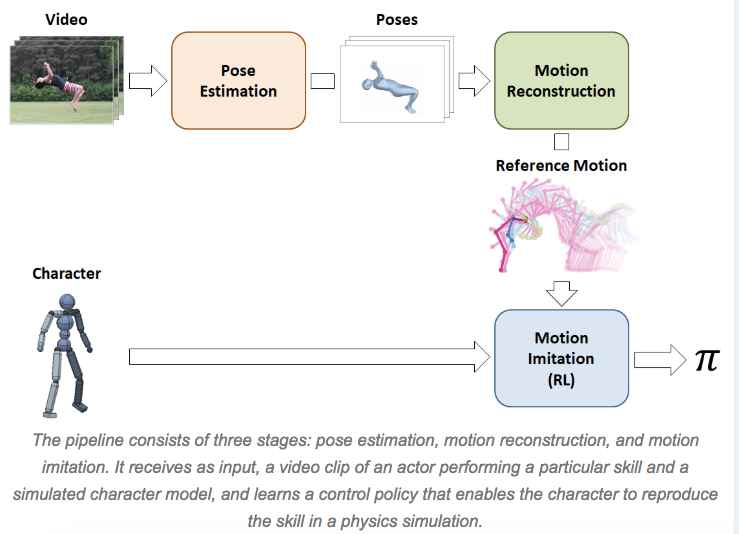 Then the “motion reconstruction” reorganizes these predictions into “reference motion.” The final process simulates the data with animated characters that continue to train via reinforcement learning. The SFV platform is actually an update to Peng and Kanazawa’s earlier system, DeepMimic, for using motion capture video. To date, the results have been staggering with 20 different skills acquired just from ordinary online videos. Humbly, the Berkley lab admits that most YouTube videos are still too complicated for their AI to imitate. Whimsically, Peng and Kanazawa single out dancing “Gangnam style” as one of these hurdles. “We still have all of our work ahead of us,” declares the researchers, “and we hope that this work will help inspire future techniques that will enable agents to take advantage of the massive volume of publicly available video data to acquire a truly staggering array of skills.” After all, it’s still the first inning. Batter up!